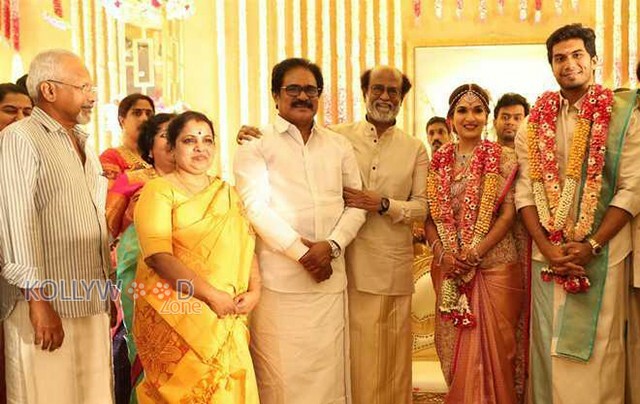 Home Kollywood News Exclusive Sneak Peek of Soundarya Rajinikanth’s wedding! The year 2019 has been a blessed year for Superstar Rajinikanth (so far), with the success of his super hit movie ‘Petta’ at one end and the wedding of his second daughter Soundarya Rajinikanth with actor and Apex Laboratories company’s director Vishagan Vanangamudi at the other end. 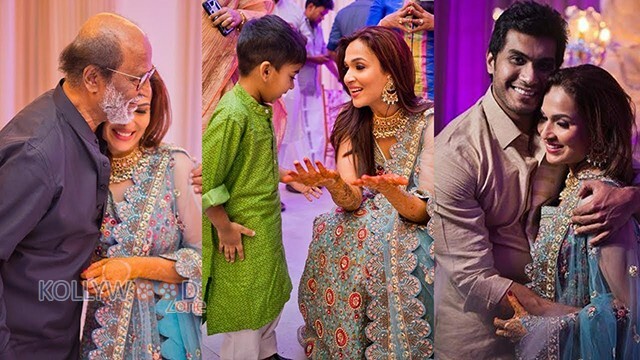 The pictures of Superstar Rajinikanth and Soundarya Rajinikanth sharing bliss moments during the Sangeet ceremony went viral along with the dance video of Superstar himself. The private ceremony was attended only by family members and close friends. A lavish pre-wedding reception was held last week at Raghavendra Mandapam and the Sangeet function was held yesterday. The couple got hitched today at the Leela Palace hotel in Chennai. The ceremony was graced by many prominent faces of Tamil film industry as well as politicians like Vaiko and Tamil Nadu Chief Minister Edappadi Palanisamy. He attended the wedding along with Deputy CM O. Panneerselvam and several other ADMK ministers. President of DMK (Dravida Munnetra Kazhagam) also graced the occasion. Legendary actor Kamal Haasan actor Vijay’s father SA Chandrasekar, and Soundarya Rajinikanth’s brother-in-law Dhanush was also spotted together with Rajinikanth. 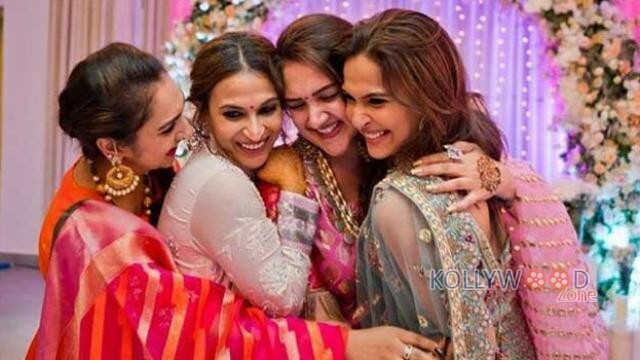 The marriage is a starry affair as many famous Kollywood stars like Anirudh, Lakshmi Manchu, Selvaraghavan, Aditi Rao Hydari, Manjima Mohan, and Andrea Jeremiah made their presence felt at the wedding. The first pictures of the gorgeous bride and groom is trending on the social media and both of them look lovely in the wedding attire. The social media sites are flooded with congratulatory messages for the couple and their families. 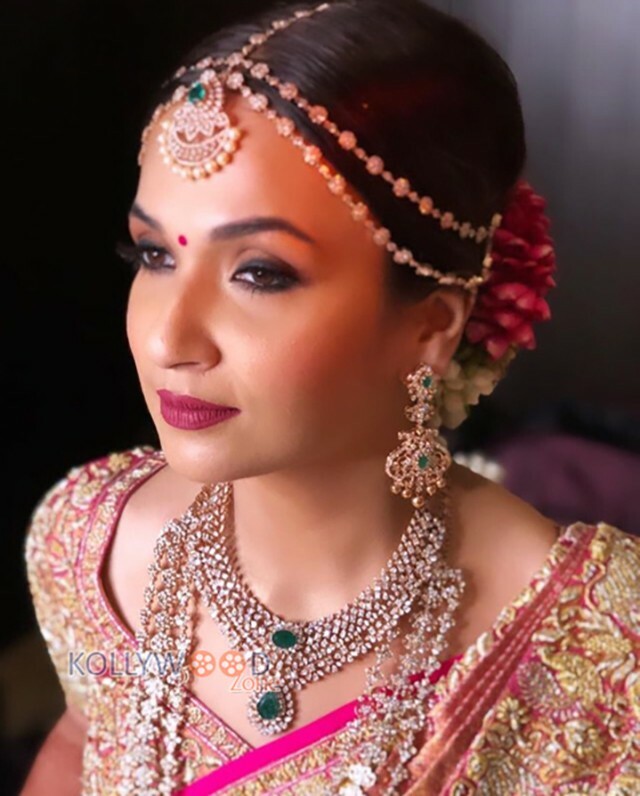 The blushing bride was dressed in a beautiful pink Kancheepuram silk saree by designers Sandeep Khosla and Abu Jani accompanied with stunning emerald and diamond jewelry. 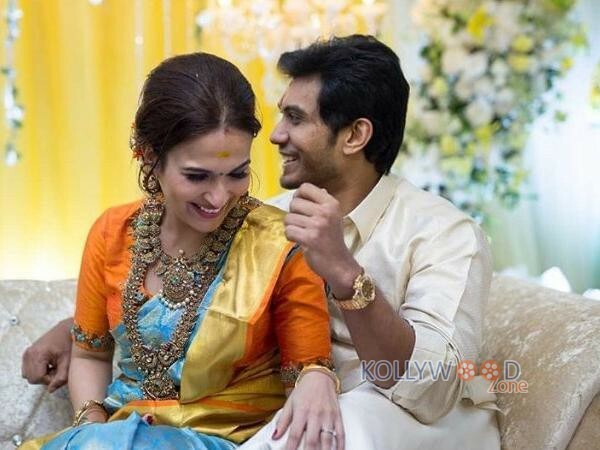 Soundarya Rajinikanth and Vishagan Vanangamudi have planned a cocktail party in the evening today to celebrate their marriage with their celebrity friends. Priya Prakash Varrier’s new video receives backlash from netizens!